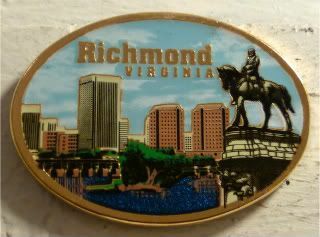 Remember how I spent a week in Richmond, and then failed to actually pick up a magnet for the collection? Voila! Picked it because I recently watched Tim McGraw trace his paternal family tree all the way back through Virginia, Washington, D.C., New York and then Germany, where his eight-times-removed grandfather came across on a ship via England with some of Elvis' relatives. Pretty cool. I've only seen two episodes (David Tennant's [natch] and McGraw's), but whomever came up with the show Who Do You Think You Are? is a freakin' genius. Originally a UK show, it follows celebs as they trace their bloodlines as far as they can go. The cool thing is that the bulk of the work gets done for them, either by Ancestry.com (great placement, by the way) or various libraries or genealogy experts, leaving us to tag along with the celebs as they discover where their people came from. I mean, ole Tim had me sniffling with just his opening scene! In seventh grade, I traced the family tree back a generation or two through oral records and hearsay, but I didn't really have anything official. My parents came from the Philippines through LAX to O'Hare a year before I was born, so I'd have to travel a world away to trace my heritage beyond my grandparents. Which is what one of my Twitterpals did, as it turns out. She and I have Twitterbonded over TV shows and cuteboys over the last few months, but never really knew anything personal about each other. When I Tweeted that I was watching Tim McGraw's story, she mentioned loving the show, and how she went to go find her own grandfather's roots. And I said exactly what I said above, I'd love to do the same, but I'd have to travel to the Philippines, and Lord knows how their records were, after a certain point. Still. An amazing, and quite inspiring story. If she could track down her roots in a remote village, finding mine in Cebu City should be a piece of cake! Food for thought on our next trip to the homeland. Hearing her story also makes me wish that they'd do a regular folk Who Do You Think You Are? series. The journeys would be just as cool, methinks. Of course, I do find it extremely funny (and fitting! ), that in all the world, through an online friend that I met on a completely separate messageboard, I somehow managed to end up Twitterpals with a chick who is part-Kababayan.